Let this be a lesson to all organizations on social media, be secure. 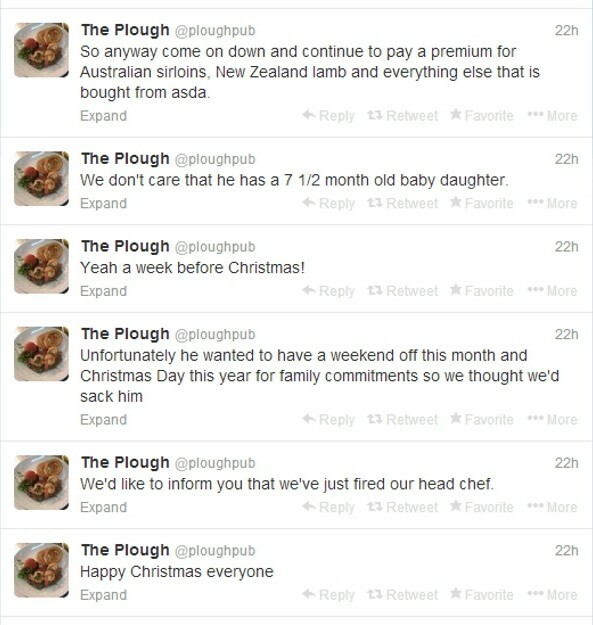 Yesterday when the head chef of a local restaurant in Oxfordshire, England was fired a week before Christmas, he wasted little time before heading to Twitter to share his anger with the situation. Unfortunately for the restaurant, Knight still had access to the company’s twitter account and decided to use the brand’s platform to share his story. In just 7 tweets, chef Jim Knight’s rant gained nearly 12 000 retweets and 3500 favourites — an incredible number for the otherwise quiet Twitter account. To make matters worse, the tweets are still viewable, as the disgruntled chef was the only member of the restaurant that had access to the social media profile. Whether you are an organization of 10 employees or 10 000, you can never be too careful when it comes to the security and protection of your brand’s image. Here are three key ways to keep your organization’s social accounts safe and secure. Giving employees access to the power of social media without any basic education is tantamount to handing over keys to the car without a driver’s ed course. Structured training on security and compliance issues, as well as on more advanced themes like using social media to sell to clients and improve internal workflows, is critical. Fortunately, some of the best social media tools now come equipped with online courseware and webinars for their users. Learn more about how social media education and HootSuite University can help. Entrusting the keys to your company’s social accounts to entry-level employees or interns carries significant risk. A better approach is to regulate access through a system of limited permissions. Using HootSuite, for instance, companies can grant junior employees limited permission to draft messages, which must then be fed into an approval queue for senior management to sign off on before publishing. This ensures that all social messaging meets company standards and no illicit tweets or posts slip through. At many companies, senior management have no clue what their social media passwords are. From an IT perspective, this is terrifying. A better approach is to use what’s known as single sign-on technology. Business-grade social media management systems allow employees to log into social media accounts with the same username and password used for their company email. The master switch for turning accounts on and off remains in the hands of the IT department, who can also revoke access from individual employees, should the need ever arise. For smaller business, like restaurants, enhancing password security can be as simple as establishing key stakeholders, like the business owners, and limiting posting capabilities to those individuals. For any organization, small or large, it is vital that stakeholders have the ability to suddenly ‘kill switch’ social media accounts if needed. To learn more about how HootSuite can work with you to protect your organization, visit the HootSuite Security Services page.